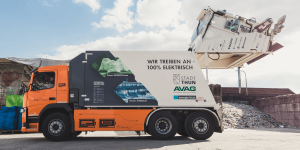 The City of Basel has been given the green light by the Grand Council to purchase electric refuse collection vehicles and the associated charging infrastructure. The civil engineering office intends to procure the new electric trucks in two tranches, with the delivery of the first nine electric vehicles scheduled for 2021. In total, the Grand Council has granted approval for the procurement of 20 refuse collection vehicles, the tender for which is now being prepared. The remaining 240 vehicles will also be replaced by electric ones at the end of their service lives. Specifically, the city intends to achieve 90 per cent of the conversion by 2025. As reported, the cantonal government of Basel-Stadt had already applied to the Grand Council for 19.11 million Swiss francs (just under 17 million euros) for the purchase of the electric refuse trucks at the beginning of the year. This sum has now been approved by the committee. The electric fleet is to be charged overnight at a total of six locations of the city cleaning department and in the workshop of the civil engineering office. The municipality wants to exclusively use green electricity.